A monkey was a mainstay attraction of the second-floor boys’ shop at Myers Brothers Department Store in Springfield for much of the 1950s. Actually, there were at least two monkeys – “Weegee,” who went on display at Myers in 1952, and “Tiki,” who came to the store in 1957. Left unstated is what happened to both monkeys. Newspaper stories also are unclear about Weegee’s species. When Weegee, then unnamed, arrived at Myers in May 1952, stories described him as a cinnamon ringtail monkey, a kind of Capuchin monkey, a species native to South America. By 1954, when Weegee got a new home on Myers’ “Floor of the Future” men’s and boys’ department, however, he was being called an African green monkey. 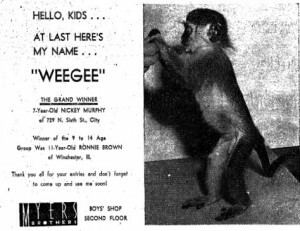 The monkey was a hit from the beginning — more than 100 children witnessed his arrival at the store, and Myers Brothers made Weegee a centerpiece of its boys’ clothing marketing efforts. Weegee was named by Nickey Murphy of the 700 block of North Sixth Street, who won a children’s contest in 1952 to choose the monkey’s name. Murphy’s prizes included a bicycle and “a complete wardrobe including shirts by Rob Roy, hose by Le Roi and a TEN WAY SUIT BY TON & CAMPUS” (capitalization in original). The next July, Weegee’s “first birthday” was celebrated with two free children’s parties at the Fox-Lincoln movie theater, emceed by WTAX radio personality Bill Miller. Whatever happened to Weegee, Myers Brothers repeated its naming contest when the store obtained a new monkey – from the advertising illustration, it apparently was a Madagascar ring-tailed lemur – in September 1957. 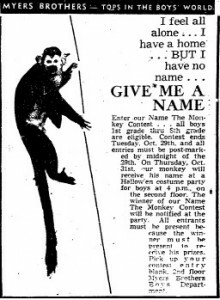 The 1957 contest was open only to boys in first through eighth grades (the monkey again was to be housed in the boys’ clothing department). The winner, John Mulcahy, not otherwise identified, was announced at a Halloween party, also open only to boys, hosted by WICS-TV personality Bill “Pegwill Pete” Wingerter. Mulcahy also won a new bicycle for his suggestion that the monkey be named Tiki. Weegee or Tiki might have moved out of the boys’ department at some point. SangamonLink reader Mary Hawkins, whose comment suggested this entry, said she remembers seeing Myers Brothers’ monkey in a cage in the credit office, which was on an upper floor of the store. Myers Brothers in 1958 sponsored “Monkey Shines,” a show featuring “Mr. Garland Parnell, famous trainer, and his personality-plus monkeys,” but newspaper records include no other references to Tiki or any other resident monkeys at the department store. More information: See SangamonLink’s entry (including Mary Hawkins’ comment) on Myers Brothers Department Store. Hat tip: Thanks to Mary Hawkins for inspiring this entry. This entry was posted in Amusements, Business, Children, Department stores. Bookmark the permalink.